... Teach a man to run his own website and you have saved him a lot of money. I offer comprehensive 1 to 1 training covering Content Management System, Online Store and other aspects of your website. Together with my webdesign prices this is an offer that can't be beaten. Budget solution to get you online fast. Comes with Content Management System. One year's hosting and domain name included. Create and manage your content yourself. Search engine optimised, Facebook ready. Full Content Management training provided. Full-featured, easy to use, future-proof solution. Training provided if needed. No product number limit. Hello, I am Andy – web designer and developer, at your service. I am a Polish guy living in Ireland. I have over 15 years of experience in graphic design and web development, 8 years of that in Ireland. I am focused on my customers' return on investment and creating things that makes them money. I am proficient with online marketing and measuring its results. Visit portfolio page to see my recent work. Read below and see what I can do for you. If you have any questions, please do not hesitate to email me or drop me a line on 086 06 44 841 anytime. In traditional website design company you will find people who add to the bill, but do not add value to your website. Webdesign company needs them to run its business. But do they make your website better? Fancy office, yoga classes and gym passes for staff to keep them motivated - are you willing to pay for this? Startups, Small and Medium companies need value. Hiring a full design studio to do a website for them is an overkill. Save money. I have no costs to pass on to you. 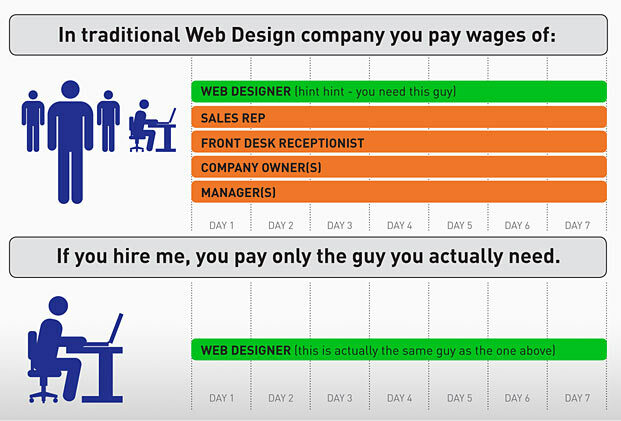 Thus, you pay only for work that benefits your website. You can get full-functional, unlimited-pages, CMS driven website for what many companies charge for 1-page static (no content management) solution. Wordpress CMS lets you create and manage content without technical knowledge. It automates multiple tasks to make your content search engine and Facebook friendly. You can focus on your content and marketing, not technicalities. I believe in educating customers and enabling them to be self-sufficient in managing their websites and online marketing. With hands on training it is easy to grasp and will save you a lot of money. Nobody knows your business and customers like you do. While you want to expand functionality, make changes to the layout or just need advice on day-to-day management of your site you have a responsive partner to fix your problems and advise the best solutions for your needs.